Shellie Marengo Moses is a South Mississippi success story that embodies the spirit of the people who have called this place home for generations. As the South Mississippi Director of Make-A-Wish Mississippi she touches the lives and hearts of our states children with a gentle smile, an understanding heart and a head for business. Shellie grew up in Gulfport and resides there today with her husband, Chase. They have been married 23 years and their son, Chase Jr., is studying Political Science at the University of Southern Mississippi. Chase Sr. is the co-owner of Moses Men’s Wear in Gulfport. Moses Men’s Wear was opened over 93 years ago by his great great uncle and then was passed on to his grandfather. Later, Chases’ father and uncle ran the business and now Chase and his cousin, David Moses, are at the helm. The store remains in the same location in Gulfport where it was first built in 1920. Shellie graduated from Gulfport High and received her Bachelor of Science degree in Speech Communication with a double minor in English and Public Relations from USM. 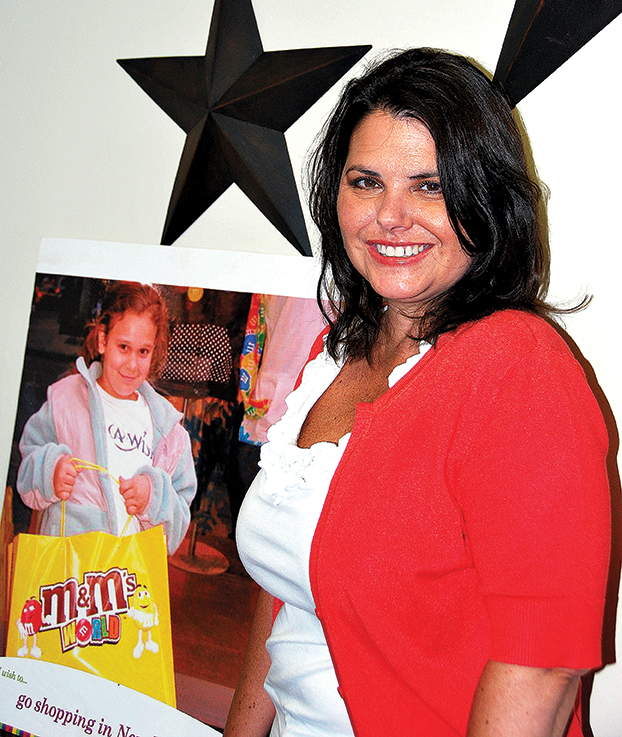 In 2001 she joined Make-A-Wish Mississippi as the Regional Director and was responsible for opening the Gulfport office. Since that time, wishes have been granted to more than 300 children who suffer from life-threatening medical conditions in South Mississippi. It is also her responsibility to grant the wishes of children who live outside the area of the Mississippi Chapter when that child’s wish either involves or takes place within the chapter. In 2010, she assumed the duties of National Corporate Alliance for the MS. Chapter and oversees all wishes to meet football legend, Brett Favre at the request of the Favre Four Hope Foundation. “The Favre family is so caring. Brett and his wife, Deanna, even cut their vacation short to come back and fulfill a child’s wish,” Shellie said. Shellie is a lifetime member of the Junior Auxiliary of Gulfport and was honored as a “Pearl” by the National Junior Auxiliary for her commitment and dedication to serving children in her community. While an active member, she served as chairman of the arts committee and actively brought the performing arts into schools throughout Harrison County. She is a past Vice-President of the PTO at St. John’s Elementary and was actively involved with the PTA at Westminster Academy where she was the cheerleading coach. She is an active member of the Krewe of Gemini where she served as Queen Leda 32nd and is a member of the St. Paul’s Carnival Association. Shellie was selected to the Who’s Who among non-profit leaders, is a member of the Coast Chamber of Commerce, was selected by the Biloxi Lions Club to receive the ‘Heart of the Lion’ award and is a member of the Gulfport Yacht Club and the Ladies Auxiliary. When Go To Places spoke with this dynamic coast native we found her charming, strong and quite busy. With the 9th Annual Martini Shakedown benefiting Make-A-Wish Mississippi only a few weeks away, Shellie seems to take the hiccups and bumps in the road in stride. “The people who are working and volunteering for this years’ shakedown are so committed and knowledgeable about what has to happen to get this off the ground that I am at ease. Oh, there are always some problems but most of these folks have been working with this fundraiser since its beginning and they really know what they’re doing. Everyone has their niche’ and it all comes together in the end,” Shellie said. The 9th Annual Martini Shakedown will be held in the Magnolia Ballroom of the Beau Rivage on Saturday, July 13th at 7 p.m. The dress is resort casual and it is a 21 and over event. There will be magnificent martinis, fabulous food, a silent auction and music by The Meanies. Tickets are $50 in advance and $75 at the door. Reserved tables are selling out fast but you can get one for your family or business for anywhere from $1,000 to $10,000 each. You can contact Shellie at 228-575-8691 or smoses@ms.wish.org. The goal for the event this year is simply to “out-do” themselves by collecting over $70,000 by the end of the evening. Make-A-Wish was able to grant wishes for 113 children in Mississippi last year and 46 of those kids were from South Mississippi. That’s a sobering thought to know that our little part of the world has so many children diagnosed with life-threatening medical conditions. Some of you have heard the story of Lexi Moore, an elementary student from North Woolmarket. Lexi is in remission now, but this former cancer patient was granted her wish through our local chapter. This year, Lexi was able to give something special back to the organization. She drew and designed the artwork for this years’ South MS. shirt. The shirt shows a tall tree with Lexi, her siblings and one of her friends playing as all kids do, out in the sunshine. Though Lexi and her family have been down a rough road, her tenacious spirit and infectious smile comes through loud and clear in her rendering of this happy moment just being a kid. Things have happened in Shellie’s life that has served to make her stronger and more aware of her own type of personal resiliency. One close call came when Shellie and her husband were sailing off the Gulfport coastline. The boat tipped and the two went into the water. Luckily the boat righted itself and the two climbed back aboard with only their cell phone becoming casualties of the incident. Shellie says that her daily work brings her in touch with the bravest people she has ever met. Often, these people are small children who smile through pain and see each day as a gift to be savored. “You know, when I’m in bed sick and feel like whining, I just can’t. I think of the children and I just pull myself up and find strength in their example,” Shellie said. Please show your support for our South Mississippi wish kids by attending the 9th Annual Martini Shakedown and while you’re there, shake the hand of the lady that makes it all possible for South Mississippi’s children with life-threatening medical conditions to have their wish come true.